Developer PMG received approval today from the FAA to build a 1,049-foot tower at 300 Biscayne Boulevard, and they fully intend to build to that height. PMG principal Ryan Shear told TNM that the developer “has full intention to use every foot.” The tower would be the tallest in Miami. The approved height is 1,041 feet above ground, or 1,049 feet above sea level. At that height, it will be taller than the 93-story Empire World Towers project that was once proposed for the same site. Details of the project haven’t yet been revealed, but it is expected to include about 500 luxury condos. PMG is currently building Echo in Brickell, if that design is any indication, than this building will be awesome! Biscayne Blvd in Downtown is the face of Miami and the skyline there should be nothing less than beautiful. STRAIGHT TO THE MOON! WOO! Two Fridays in a row? You’re spoiling us TNM. Don’t ever stop. Show us PMG! Show us now!!! This tower and World Trade Center of the Americas (953′) will be wall to wall. 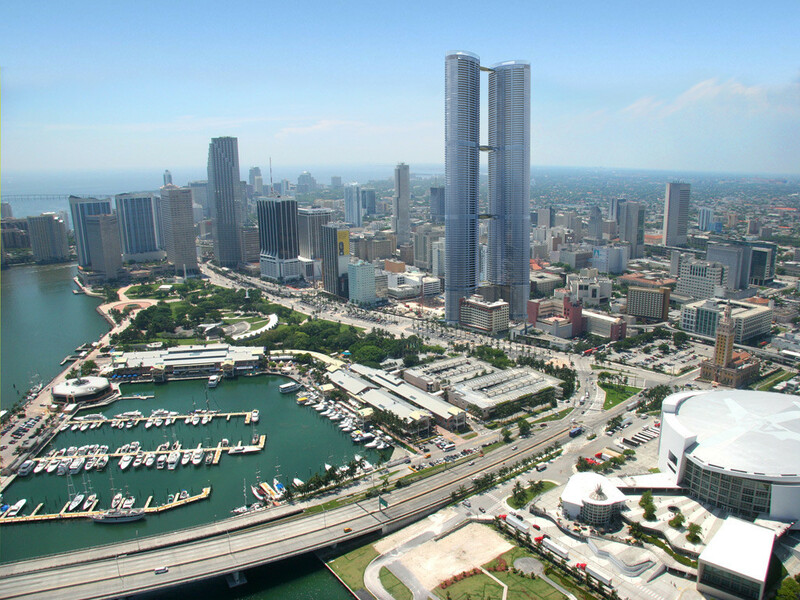 Their sheer height and design contrast (I hope) will make them the central focus of the Miami skyline. Our postcards will never look the same boys, this is 21st century Miami. Don’t forget the awe inspiring Skyrise. great news!!! PMG.designs are cutting edge….will look fantastic fronting the boulevard..i sure hope it doesn’t get shelved for years before becoming reality…looking forward to renderings….bring em’ on PMG!!!!! “Will be the tallest tower in Miami”. Berkowitz must be trembling at this news. I love PMG and their projects. If they design this tower similar to their Echo tower, then OMG! What a thing of beauty this would be. I can’t wait for the reveal. Pretty sure though the renders and plans shown for ewt were depicting 1200 feet, it was never approved at that Height but I don’t think they updated the renders to accurately show 1040 feet. I doubt it was ever planned to be 93 stories at only ~1000 feet and luxury. I know panorama is only 10 feet per floor but that is exceptionally low for a 50 story plus building. Still all very exciting nonetheless. What are you talking about? Most buildings are nine or 10 feet, and anything more is generally a double-height loft. Echo seems like a pertinent enough example…10 feet ceilings, with penthouses at 12. Nevermind, the 1,200 foot proposal was 100+ stories. ik most condos here are close to 10 feet per floor with 8 or 9 foot ceiling heights, but usually skyscrapers have taller floors. It’s just how it happens to turn out. Look at any building over 60 stories or 1,000 feet. Almost exclusively less than a story for every 10 feet. But yeah, I was right. The render shows over 100 floors like they originally proposed. And given the other enormous dimensions of the ewt proposal what you see in the picture is almost certainly much bigger than what we will get. Seems doubtful they’d best the previous design. I’d rather they just keep that (or tweak it). Unless they do actually propose something entirely novel for Miami. Yes the old design was top knotch albeit very preliminary. I’d dare to call it neo-futurism. very old picture, alot of missing buildings. why did they do that? Nice little artist render but leaving out the structures on the 200 block of Biscayne is distracting. No Viscayne or Loft there? Anyways, does anyone know what they plan to do with the Holiday Inn? This image leaves it there so I’m wondering if it is staying. Can’t wait to see the design! Another post on a Friday?! Keep it coming!! It’s going to be interesting what they come up with considering what their neighbor is proposing. First time for us down here to have two developers really competing for the spotlight .I figure this is the usual in NYC. Definitely. Competition benefits us all. It will force the developers into delivering their very best. Let them all compete to build and fill in the gaps and empty lots. We already have the 3rd largest skyline in the US with no sign of stopping.